Something very special is happening out in Beeston, just west of Nottingham. No, I don’t mean the new tram line, although that should be welcomed, particularly since it’ll be easier for visitors to get out to today’s Coffee Spot. Instead I’m referring to the Greenhood Coffee House, which opened at the start of July. Much of Nottingham’s speciality coffee scene can trace its roots back to The Bean, a Beeston fixture of some renown just around the corner from Greenhood. In this respect, Greenhood’s no different, owner Rory having worked there for several years. However, Rory’s now struck out on his own, opening Greenhood, a speciality coffee shop which is proving as popular with the locals as it is with the connoisseur. On espresso, there’s a bespoke house-blend from Has Bean on one grinder, while local roasters, Outpost Coffee Roasters, is a permanent fixture on another. There’s even a third dedicated grinder for decaf. These are joined by three filter options, available through Chemex, V60 or Aeropress. Here Has Bean is joined by local roasters such as Sundlaug Coffee Co. and some from further afield, including Berlin’s Five Elephant and Philadelphia’s ReAnimator! Loose-leaf tea is from Waterloo Tea amongst others. Greenhood Coffee House sits on Beeston’s pedestrianised High Road at the corner of Acacia Walk. Striking the right note from the outset, the large, clear windows which flank the door, also extend a long way down Acacia Walk, presenting a pleasingly clean, uncluttered interior. It has a strange layout though. Greenhood presents a narrow store-front on the High Road, but extends a long way back along Acacia Walk, allowing it to have windows along much of its left-hand side. Long and thin, the seating occupies the bright, sunny space at the front, making best use of the windows. Immediately to the right of the door, which is in the middle of the short side, is a three-person window-bar, looking out onto the High Road. To the left, a pair of stools act as impromptu tables for local newspapers and magazines. Next come the tables. To the left, there’s a two-person and four-person table, separated by a paint-splattered step-ladder, doubling as a magazine rack. On the right, there’s a low, six-person table and a high, three-person one. Finally, just as the store narrows, there’s a large, comfortable two-person sofa. The counter, however, is missing. You’ll find it right at the back, past racks of beans and retail coffee kit, down a narrow corridor along the left-hand side. Occupying a square spot at the far end of the store, it looks like it’s been thrown together out of chipboard. The broad counter-front holds till, cake and filter kit, while espresso machine and an impressive four grinders are behind it against the right-hand wall. The layout makes (more) sense when you turn around. Behind you, occupying the space to the corridor’s right, a flight of steps leads to a lovely upstairs space. Just as bright and airy as downstairs, it’s much quieter, with no stream of customers constantly coming and going. The kitchen occupies the space above the corridor, but it’s safely tucked away behind a closed door. The rest’s given over to seating, with tables to left and right, then, beyond a half-screen, more tables, including a lovely, five-person round table and small window-bar. Another striking feature of Greenhood is that once you make it to the counter, there’s no menu. I first encountered this in La Colombe in Philadelphia. Owner Rory has several reasons for dispensing with the menu, not least because he changes coffee so often, he doesn’t want to have to keep re-writing it. However, the main reason’s the same as La Colombe’s: not providing a menu forces the customer to engage with the barista (and vice versa), giving an extra opportunity to talk about the coffee. Greenhood’s house-blend is Dark Archer (40% Ethiopian natural, 20% Tanzanian natural, 40% Costa Rica Red Honey), which is used for milk drinks, while the guest, Outpost’s single-origin Colombian is offered as espresso. I tried them both as espresso, finding the Dark Archer to be very smooth and, especially on the first mouthful, sweet. It got sharper and fruiter with the second/third mouthfuls. 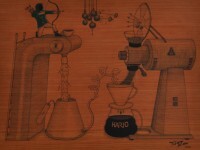 In contrast, Outpost’s single-origin was a more complex cup, sharper and fruitier than the Dark Archer. On filter, there’s Greenhood’s Quiver blend and a single-origin, both from Has Bean, plus a washed Ethiopian from Sundlaug Coffee Co.. I tried this through a Chemex, finding it a very clean, drinkable cup. In other news, Greenhood has won the 2015 Coffee Spot Special Award. You can see what local coffee bloggers, Notts Coffee, made of Greenhood Coffee House, while there’s this view from local blogger, Helen. This entry was posted in Beeston (Nottingham), Cake, Coffee Shops, Laptop Friendly, Retailers, Sandwiches and tagged include by Brian Williams. Bookmark the permalink.